What can I say? Gooey, cheesy goodness ... and for once picky dd would agree! Quick and easy to make with pantry staples since we're still flooded in! Though that's not as bad as it sounds. We were only stuck for two days. I just did a lot of cooking and blogging while we had to be home. As I'm writing this (and as your reading this) the waters have receded and clean-up has begun. Driving through town this morning there were few signs of the flood. Aside from the new water features at the city golf course, there wasn't much to show that waters had been about 3 foot deep in that area. Inside the homes would be a different story though. :-( We haven't been anywhere today without hearing sad stories from people directly affected by the flood. Rachael Ray's Cheddar Cheese and Macaroni definitely hit the spot last night. Easy to make and well short of the 30 minute mark. I'd saved the recipe after spotting it over at Family, Friends and Food a while back but hadn't gotten around to making it. Thanks Patsy! This recipe is definitely a keeper! Heat a medium-sized deep skillet over medium heat. Add oil and butter. When butter melts into the oil, stir in flour. Gently cook, whisking flour and butter together, until smooth and flour has had a chance to cook, about 3 minutes. Slowly add milk while continuing to whisk. Gently bring milk to a bubble while stirring frequently. Allow the milk to thicken a bit, then stir in 2 cups of shredded cheddar cheese, a handful at a time. Season sauce with nutmeg and cayenne. Taste and add a little salt, if you like. 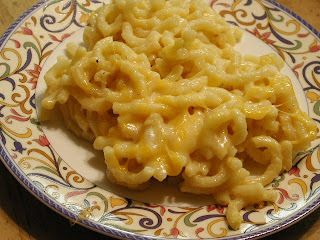 Add cooked pasta to the sauce and coat completely by turning over and over in the cheese sauce. Transfer to a baking dish, top with remaining cheese, and place under a hot broiler for a minute to brown the top. I'm happy to see you enjoyed it! I need to give it another go as my youngest does love his mac & cheese!